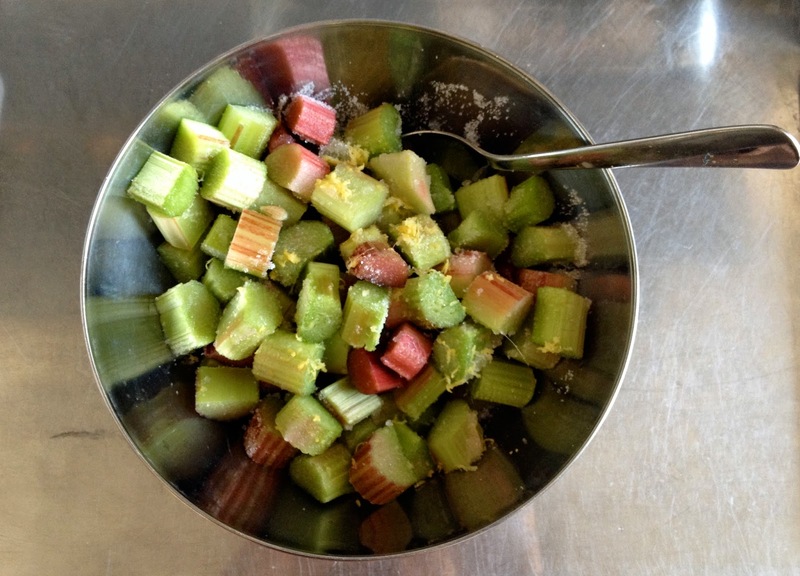 Spring is rhubarb season and I love it! Rhubarb is both sweet and sour and makes for nice summery desserts, like rhubarb pie, rhubarb walnut muffins, and rhubarb almond cake. 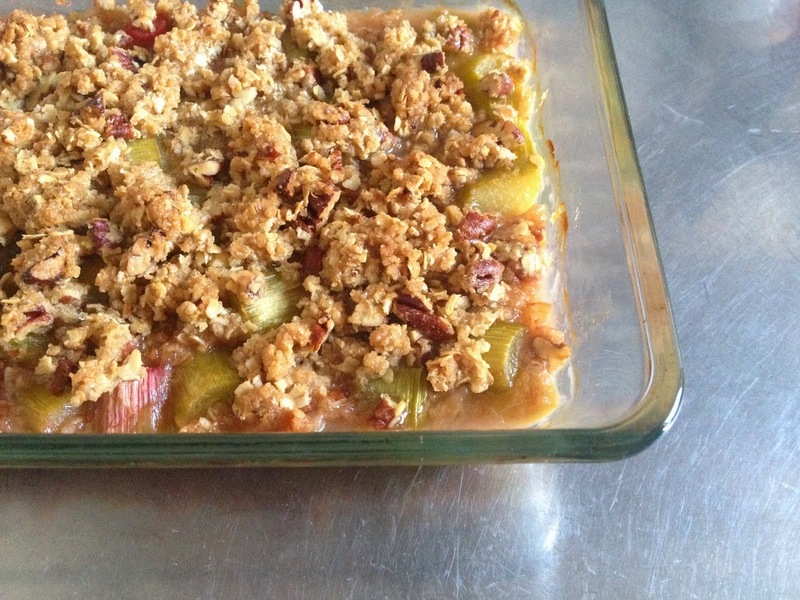 Since a few years now, I make rhubarb crumble, with rhubarb from my parents garden :-), but I never posted the recipe, simply because I couldn't manage to make nice pics of it. I'm still not very satisfied with these pics but I'd like to share the recipe. This crumble is based on butter, sugar, and flour, like most crumbles, and it also includes pecan nuts, cinnamon, and oats to add some extra crunchy and taste to it. If you have guests over, you can bake it during dinner and serve it (luke)warm with some vanilla ice-cream, like the one from my favorite ice-cream shop in Lausanne, it will taste great! In a bowl mix rhubarb pieces, sugar, and lemon; set aside. In another bowl, mix brown sugar, flour, cinnamon, salt and butter by hand. Add oats and nuts and mix. Generously butter a baking pan. 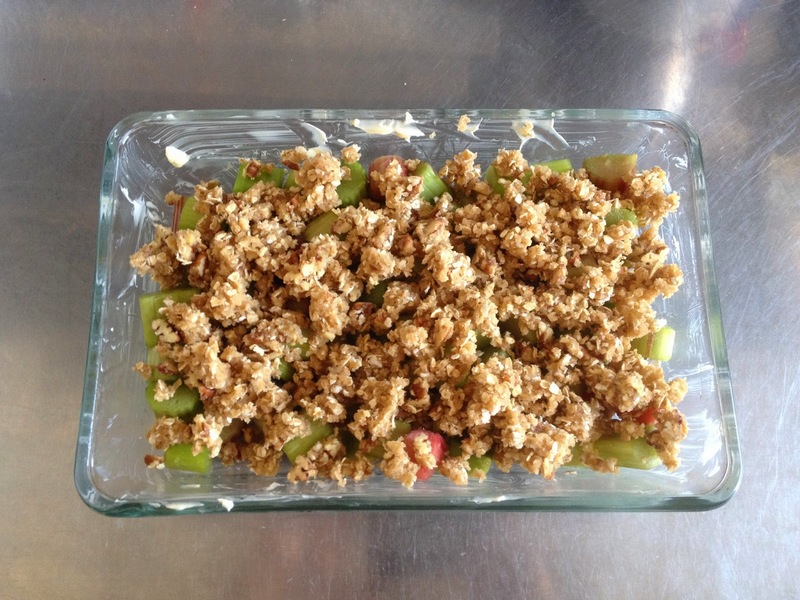 Add rhubarb pieces (without the juice that came out while sitting) and cover with the crumble mix. Bake in the oven 45-50 min at 180 C until crunchy and golden. Let it cool down a bit and serve with vanilla ice cream. Enjoy!